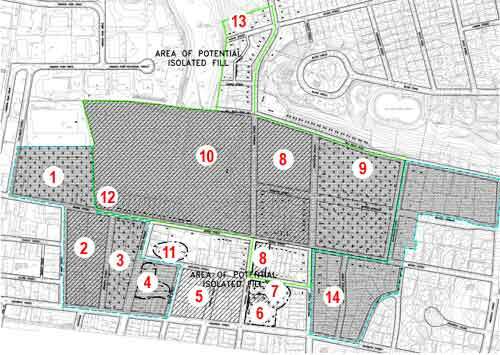 (Download the complete map. You need Adobe Acrobat Reader to view the file. 3Coke lot, City of New Haven asphalt scraping disposal area was located in the block bound by Goodrich, Butler and Marlboro Streets and Shelton Avenue. This site was used as a dumping ground by both the City of New Haven and the Winchester Repeating Arms Company in the early 1920s and 1930s. Coke lot - The area bounded by Goodrich, Butler, Newhall and Marlboro Streets from Winchester was filled by the Winchester Repeating Arms Company in 1915. WRA Disposal Area – Received various forms of fill from the Winchester Company in the 1920s. Mill Rock Dump (Also known as the Winchester Dump, Wadsworth Street Dump and Morse Street Dump) Served as a Public Refuse Dump in the 1920s – May 1941. Newhall Street Dump or Morse Street Dump (after 1947) received Winchester Repeating Arms fill. 95 Marlboro Street - Private dump on Marlboro Street that operated from 1957-1958. 319 Morse Street – A Private Automotive Dump was located at this address in the 1930s. Augur Street uncertain Reports of debris fill at properties on the north side of Augur Street uncertain time frame. North Sheffield Street – There have been reports of debris fill in residential properties during an uncertain time frame. In Highwood, wetland filling took place through a combination of town and business ventures. WRA filled the area between Mill Rock Road and Morse Street, east of Newhall Street, in 1917 with various materials including “granule-like, coal ash” (Haley & Aldrich, p. 29). WRA also raised the area between Morse, Goodrich, Edward and St. Mary Streets approximately 15 feet with fill (Haley & Aldrich, p. 29). Cinder and ash were also deposited by WRA in the area east of Newhall Street near the current Christian Tabernacle Church (Haley & Aldrich, p. 29). Around the same time, WRA also filled the four-acre marshy area west of Newhall Street between Goodrich, Marlboro and Butler Streets with “clean trash and furnace cinders”( Haley & Aldrich, p. 29). Between 1900 and 1903, the New Haven Water Company purchased 28 acres of swampy land commonly known as Newhall Swamp. Newhall Swamp was located on the site of the current Hamden Middle School and its associated athletic fields (Haley & Aldrich, p. 33). The Water Company initially purchased the land to provide protection for its water supply, but by 1919, the Water Company began draining the swamp and later, in the 1920s, it was used as a dump. In 1924, it was taken over by the Winchester Company and later filled by that company (Haley & Aldrich, p. 31). Anecdotal reports state that the “Winchester Dump was filled with thousands of shotgun shells” (Haley & Aldrich, p. 35). The refuse of local residents was still deposited in the low, still-swampy area of the dump (Haley & Aldrich, p. 35). Former residents reported that scrap metal, lead pellets, batteries, and barrels with oil, grease, and acids were disposed of at this site (Haley & Aldrich, p. 37). In 1928, under the direction of Dr. W. E. Britton, State Entomologist, and Mr. R. C. Botsford, Deputy in Charge of Mosquito Elimination of the Connecticut Experiment Station, a wetland drainage program was established that included the draining of “571 acres in Hamden”. The Hamden Health Department in that year stated that malaria was still a threat in the Newhall Neighborhood (Haley & Aldrich, p. 30). Throughout the 1920 a variety of methods were used to eliminate mosquitoes. These included chemical spraying, draining, ditching and spraying with oil, but wetlands filling remained the preferred method of mosquito elimination (Haley & Aldrich, p. 30). Unauthorized dumping in wetlands by private citizens continued through the 1930s. The Town made attempts to consolidate and make use of its waste by using it for fill. By 1935, there were four public dumps in Hamden. In Highwood during the 1930s, there were dumps located on Newhall and Morse Streets. In 1936, a local newspaper reported the Hamden Health Director as saying that the “Newhall Street dumps, between Augur and Goodrich Streets and north of the Newhall Street School are in deplorable condition” (Haley & Aldrich, p. 31). In 1937, the Hamden Board of Health suggested that the Mill Rock and Newhall Street dumps be shut down (Haley & Aldrich, p. 31). It was noted about the Newhall Street dump that “at the rate the dump has been filling up, by May 1, the mosquito breeding place would be filled in, be leveled and the dump discontinued” (Haley & Aldrich, p. 32). The Health Director suggested that the land be leveled and conditioned for use as a “public park or playground” (Haley & Aldrich, p. 32). In 1937, the Newhall Street dump site was graded and filled with topsoil, and in 1939 the Rochford Field was dedicated (Haley & Aldrich, p. 45). 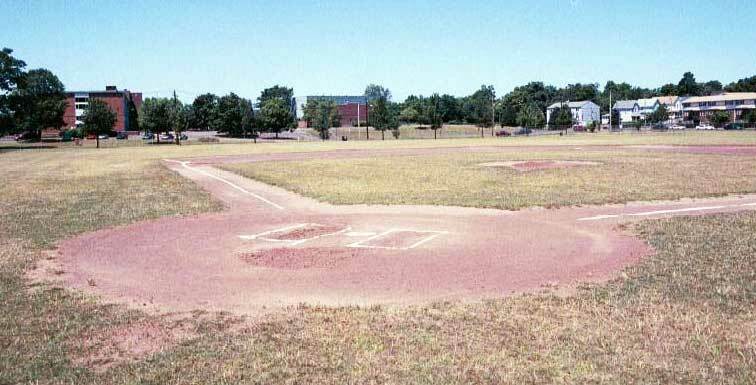 Rochford Park Baseball Field as it looks today (Source: Hamden Plan of Conservation and Development). The Mill Rock dump was located in the block bounded by Wadsworth and Morse Streets, Mill Rock Road, and Winchester Avenue. It operated until approximately 1941 (Haley & Aldrich, p. 31). This dump was first known as the Winchester dump but was called a variety of names over the years and served as a public dumping ground from the 1920s to 1941. After 1941, the area was reconditioned for use as Mill Rock Park, an annex to Rochford Park. After the Mill Rock dump was closed, the land is the surrounding area on Bryden Terrace, Morse Street and Mill Rock Road were filled with more homes (Haley & Aldrich, p. 32). Before 1947, when the Winchester Factory installed an incinerator at their factory, papers were also deposited and burned at the Newhall Street Dump (this one was owned by WRA) located on and near the current Middle School site. This dump was known as the Morse Street dump after 1947. The town acquired the dump site in 1950 for use as a school, but WRA continued to dispose of waste on the site for approximately four years (Haley & Aldrich, p. 37). Residential and municipal development of the Newhall Street neighborhoods continued swiftly after 1950. In 1956, Hamden Middle School (known at the time as Michael J. Whalen Junior High School) opened on Newhall Street near the site of the former Newhall Street dump. In 1957, it was noted that the former dump had not yet been covered with “adequate dirt.” (Haley & Aldrich, p. 37) Area residents continued to use the sunken area behind the school to illegally dump their refuse until 1976 (Haley & Aldrich, p. 38). In 1976, the sunken area was further filled so that the Hamden Middle School could expand their athletic fields. The area was filled with 100,000 yards of clean fill (Haley & Aldrich, p. 38). The Newhall Street School operated as a middle school until 1980, when it was converted to government offices, and later it served as the Hamden Community Center (Haley & Aldrich, p. 48).